There are probably people who always make their pizza the same way, with a go-to crust recipe. And then there are people who call pizza all the things that have an element somehow related to pizza. Obviously, I’m the latter type. The fact that this is my sixth pizza recipe on this site speaks for itself too. But who doesn’t love a good slice of pizza? If you ask me, I think the world of pizza has endless options. Especially when it comes to gluten-free (+ vegan) pizza crusts, I think it’s great to explore lots of different kinds of recipes in order to find the ones that you really adore (like people usually either love or hate cauliflower pizza. I really like it and my husband does not. Yay.). I like both crispy and soft crusts, thin and thick ones, but most of all I really love if the crust is super easy to whip up. Preferably no kneading involved and no messing up your hands in dough. 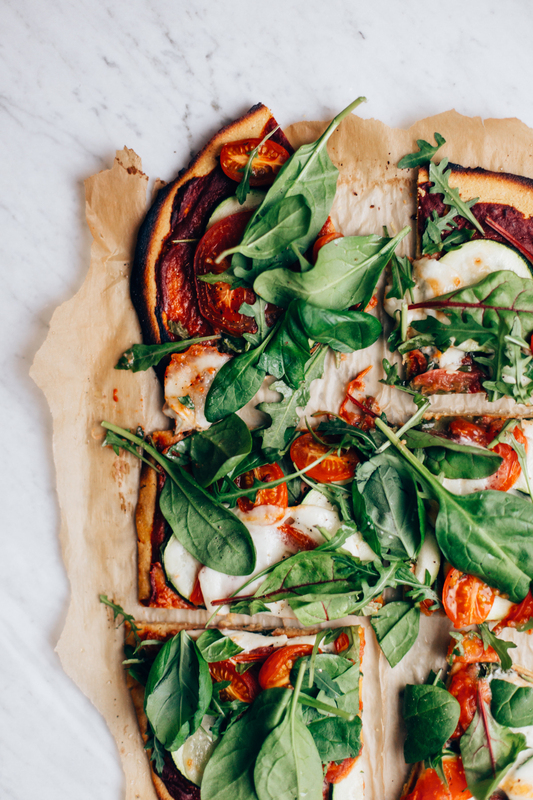 Enter: this easy peasy of a pizza with chickpea flour crust! This really is the easiest crust ever, as you just mix all the ingredients in a big bowl and then pour the dough onto a baking sheet. This is the best kind of easiness there is. 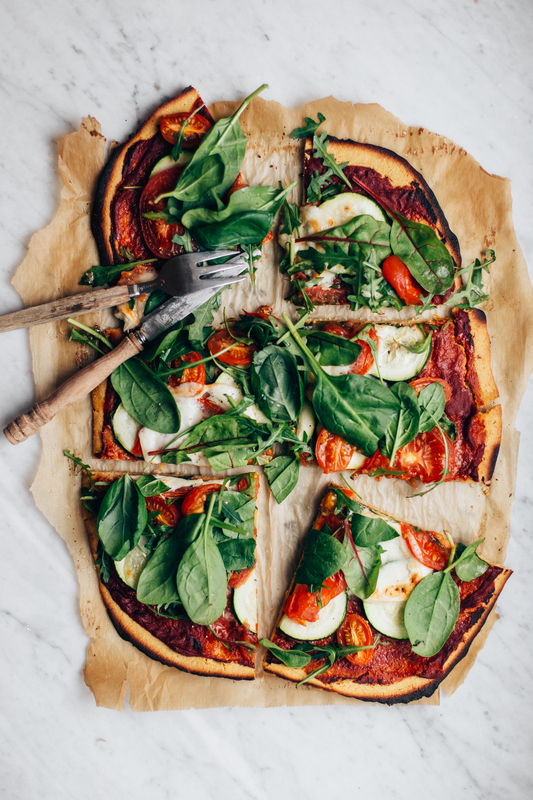 I think pizza toppings are a personal matter (no judgement here on the weird things you like) but my favorites include thinly sliced zucchini, cherry tomatoes, soft mozzarella, and once the pizza is done, I like to top it with fresh greens. A handful of greens makes the pizza somehow really fresh, and since you’re eating your salad on top of your pizza, it’s a total win-win situation. Happy pizza times to all you fellow food lovers out there! 1. Preheat the oven to 225 C / 425 F degrees and cover a baking sheet with baking paper. 2. Measure the chickpea flour, water, olive oil, salt, and cumin to a large bowl and mix well with a whisk so that there are no clumps. Pour the dough onto the baking sheet and spread with a spoon to an oval shaped base. 2. Bake the crust for about 15 minutes until it has a beautiful golden-brown color and feels slightly crispy. In the meantime, slice the zucchini, tomatoes and mozzarella into thin slices. 3. Take the crust out of the oven and spread the tomato paste evenly on top of the crust. Add other fillings (except the greens) and place back in the oven for about 10 to 15 minutes until the vegetables have softened a bit and the cheese has melted. Finish with leafy greens and some black pepper. Serve and enjoy! Tagged grain free, lunch & dinner, nut free, pizza, vegetables, vegetarian. When you're in the mood to treat yourself, these Coconut Pancakes with Mango Nice Cream and fresh fruit are the perfect feel-good treat! Both gluten-free and vegan, these are easy to make and delicious. With carrot, zucchini, banana, and whole grains, these Healthy Breakfast Muffins are a great little treat early in the morning, or in the afternoon along with a smoothie or a hot beverage. Yep, the world of pizza does have endless options! This is one more I’m super curious to try making!